This is a big day for announcements. First, IBM announced a record 6,478 patents in 2012, patents for inventions that will enable fundamental advancements across key domains that includes analytics, big data, cybersecurity, cloud, mobile, social networking, as well as industry solutions like retail, banking, healthcare, and transportations. These patented inventions also will advance a major shift in computing, known as the era of cognitive systems. There was also an early morning announcement from Los Angeles, this year’s Academy Award nominees. There was another long slate of Best Film nominees, including Amour, Argo, Beasts of the Southern Wild, Django Unchained, Les Miserables, Life of Pi, Lincoln, Silver Linings Playbook, and Zero Dark Thirty. I’ve seen five of the nine, which puts me well ahead of where I am most years in terms of what films I have and haven’t seen. Best Actor nominations were led by Daniel Day-Lewis for Lincoln and Bradley Cooper for Silver Linings Playbook. If you’ve seen Lincoln, it’s hard to see how the Best Actor Oscar doesn’t go do DDL. On the Best Actress front, the nominations were led by Juillard-trained Jessica Chastain for Zero Dark Thirty and Jennifer Lawrence in Silver Linings Playbook. But don’t rule out Emmanualle Riva for Amour, or the chamelon-like Naomi Watts in The Impossible. In a crazy year, Quvenzhane Wallis could even walk away with the Oscar for her crazy good performance in Beasts of the Southern Wild, one of the most unique, imaginative films I’ve seen in years. Quentin Tarantino got a nomination for Django Unchained in the Best Original Screenplay category, but I think that one is there for the taking by Mark Boal, screenwriter for Zero Dark Thirty. Congrats to all this year’s nominees. As a big movie fan myself, looking at that slate of Best Pic nominees, you realize what a strong movie year it’s been. Finally, on the topic of movies, if you’re a big movie fan, check out Stephen Rodrick’s piece in The New York Times magazine about the trials and tribulations renowned screenwriter-director Paul Schrader (Taxi Driver, Raging Bull, Affliction, et al.) had financing and making his new film, The Canyons, which stars that ever-intemperate actress Lindsay Lohan. Meanwhile, below I’ve included a nice video clip summarizing IBM’s 20 successive years of patent leadership, and you can learn more about IBM’s patent efforts on our Tumblr site. I was laid up most of this past weekend with allergies and a related head cold, so I didn’t make it out to the golf course or even to the Austin green belt for some mountain biking. But I did spend a lot of time watching sports on TV, starting with the Cotton Bowl on Friday night, some English Premier League games on Saturday morning, some NFL wild card games on Saturday afternoon, some FA cup games Sunday morning, and then more NFL games yesterday. All this TV watching got me to thinking about the coming Consumer Electronics Show in Las Vegas. Seems like everyone I know is asking me if I’ll be there. For the millionth time, no. I’ve never been to CES, have no compelling business reason TO go, and nobody’s given me any free tickets, so I shan’t be going anytime soon. But if you are going, have a nice time and enjoy the multitudes. I see all those crowds, it gives me flashbacks to Comdex. If you’ve never heard of Comdex, well, sorry, I can’t help you. Most of what I want to learn from CES I can get from the blogs and media coverage, in any event. Starting with this piece from The New York Times, suggesting that TV makers had better kick it into high gear and move on to the new new thing when it comes to TV watching. The net of it is is that 3D had its day and there wasn’t enough content to keep people paying a premium for 3D sets, and now “Ultra HD” is the big thing (although the premium demanded for Ultra HD sets will likely keep that a marginal segment of the market for some time). That leaves the Internet-enablement of TV sets as a logical next push, which, while on its face seems logical, has eluded some pretty smart folks for some time (including the folks at Google). Me, I’m not so sure I want my TV to become anymore Internet-enabled than it already is. I’ve tried Roku, Apple TV (both gens), and now have a Sony BlueRay player that includes some Internet enablement, and I’m about as enabled as I want to be. For me, TV is still a relaxing, kick-back experience, save for the few times when I pull out the Wii for some quick tours of “Call of Duty.” My active screen experience is reserved mostly for my computer and/or smartphones. The TV is the “dumb” box. I’m not sure I want it to get much smarter. But even if it were to get smarter, the first thing I’d want it to do is find more content, AND the kind of content that I like to watch. Thus far, even with Netflix, that seems too genius for the propeller heads to have properly figured out. So, before the TV manufacturing whizzes go off and start to build bigger, bolder, wider, and more “interactive,” don’t forget presenting the basics of filmed entertainment. We’ll see, and soon enough. As for CES, if you don’t know much about it and want to know more, Gizmodo provides this useful page giving us a little background. I find that they, CNET, and Engadget have pretty good rundowns of the goings on there. The event starts tomorrow and runs through this Friday. 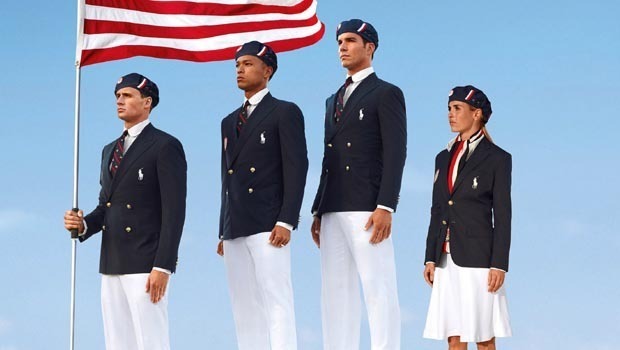 The new Ralph Lauren-designed uniforms for U.S. Olympics athletes at the coming London Olympics games may look spiffy, but a number of U.S. politicians have come out recently to complain they were manufactured in China. Let the games begin! Well, it seems that the London Olympic Games are only a couple of short weeks away now. As we get closer and closer to the lighting of the London 2012 Olympic torch, we will also start to see lines get drawn in the digital and social sand, as this will likely be the most “social” Olympic Games ever. There will be lots to juxtapose in this year’s games in London with those of Beijing in 2008. Most notably, the fact that we won’t have a 12 hour delay by the broadcast networks. Instead, NBC has already indicated that they will show many of the events live. American GDP could swoon to a new low in these London Olympic summer games! If you’re looking for a place to follow the games, there will be no shortage of television and digital opportunities. Just this week, Facebook and NBC announced a collaboration for “transmedia” coverage of the London Olympic Games. In that deal, data from Facebook will inform TV coverage on NBC and other channels that will carry portions of the Summer Games starting on July 27, according to The New York Times. The specific uses will vary, says the Times, but there will be a “Facebook Talk Meter” occasionally shown on TV to reflect what is being said online. Conversely, on Facebook the NBC Olympics page will get frequent updates with what the companies call “exclusive content” for fans only. Fans will then be able to share what videos and articles they’re perusing on the network’s Olympics website. Speaking of China, U.S. Senator Harry Reid (D-NV) castigated the U.S. Olympic Committee for its decision to have the U.S. Olympics team dressed in Ralph Lauren-designed berets, blazers and pants that were manufactured in China even as the U.S. textile industry struggles to keep U.S. workers at their sewing machines. I also found an interesting app for the iPad, the “Ultimate Olympic Guide,” which cost me a whopping $.99 and provided some nice background and overviews of each of the Olympic sports. Feel free to add any other useful London Olympics resources in the comments section below. The Interwebs platform wars continue to escalate. Not days after I read Ken Auletta’s fine New Yorker piece on the U.S. antitrust suit against Apple and several book publishers for alleged price fixing — a scheme that clearly had Amazon and its Kindle Fire in its gunsights — do we discover that Amazon is working with Foxconn on its own mobile mousetrap, one that, like the Fire, would presumably provide easy access to all kinds of compelling content from Amazon’s vast cloud of digital entertainment. Books, movies, gaming apps…Amazon’s play suggests that the Internet industry is moving into the razor/razorblade club, with the devices being the razors, and the razorblades being all that vast digital content. I, personally, mostly don’t care which razor I use. I’ve owned tablets and smartphones both Android and iOS now, and most recently have given a Kindle (not the Fire) a test drive. The most important element for me in the digital content wars are the depth and sophistication of the content libraries themselves. That is to say, help me move beyond Amazon and Apples’ 57 Channels On Demand and Nothing On! Amazon’s bookstore, of course, has virtually the world’s book population at your disposal, so no complaints when it comes to reading (although I do agree we need healthy, competitive alternatives to the Amazon reading ecosystem). But when I go into my Amazon Prime movie library, which lets me watch some movies for free with my Prime subscription, it’s like dragging the bottom of the movie barrel. Woo hoo, where do I renew my subscription??! The cloud providers may be lining to try and lock in as many denizens as they can via their device and subscription services, but the form factor is less important than the catalog function. What’s kept me from cutting my own cord on the TV is the fact that the Netflix’s and Amazons of the world don’t have enough diversity of content (never mind live event access to major sporting events, which for my money are msotly worth the high cost of monthly cable subscriptions alone). So if the Apples and Googles and Amazons really want to move these markets, they need to quickly hire some sophisticated business development executives and hard-driving attorneys who can make some negotiation headway in the hills of Hollywood’s film libraries rather than try to draw lines around the device footprints. It’s never about the razors, always about the razorblades. We lost a great writer with the passing of Nora Ephron. Judging from all the accounts of those who knew her, we also lost a great human being. I did not know her, but I knew her work. Anyone who followed American cinema over the past three decades, how could they not? Starting with the anti-love love story (about love, and Ephron’s love for New York City), “When Harry Met Sally,” when both Harry and Sally decided they couldn’t just be friends after all…“You’ve Got Mail,” the first movie that presciently understood love in the late 20th cyber century…“Julie and Julia,” which brilliantly bridged time and space, juxtaposing a young female blogger in Queens in the early oughts struggling to follow her life’s passion with Julia Childs bushwhacking her way through male-dominated culinarydom in Paris in the 1950s. What I liked most about Ephron’s writing was her humor. But I also liked that she challenged accepted and conventional wisdom about women and humanity in general…and threw most of that conventional wisdom right out the window. She understood their were universalities that underscored us all — men, women, children, — and made us all seem more like one, despite all our supposed differences. She could also brilliantly underscore those universals with her fantastic humor, humor that highlighted our common humanity and sometimes made seem so frail, but stubbornly persistent, our human condition. Or “Heartburn,” which laid bare the thorny thistles underlying marriage, again with Meryl Streep playing her alter ego to Ephron’s former husband Carl Bernstein (played devilishly by Jack Nicholson), with Ephron falling in love with the insider Washington columnist despite her (valid) fears about marriage, only to find him living a double life with another woman (John Edwards, anyone?). No, I didn’t know Nora Ephron. But for the last thirty years, I did know her work, much of which still makes me chuckle years later. That’s a rare talent, especially these days. I don’t know what it exactly what it was that Ephron had…but I’d like to have just a little bit of it nonetheless. Remember that scene from the movie “The Social Network,” the one where Sean Parker is advising Facebook co-founder Eduardo Saverin over cocktails? Eduardo Saverin: (As the scene shifts back to the deposition room): A billion dollars! With the looming Facebook IPO, it seems that Parker was off only by a factor of 100, but a minor detail. Well, it appears Facebook is not the only one reaching the upper echelons of the Internet stratosphere. Overnight, TechCrunch reported that in Rovio’s newsletter this week, the company announced its own revenues had increased by more than tenfold in 2011, and that its “Angry Birds” gaming phenom had passed the one billion download mark. I can see the big Angry Birds McDonald sign in the sky now, over 1 billion Angry Birds served! What’s probably less well known is that Rovio has turned into a merchandising juggernaut, selling Angry Birds-stamped merchandise ranging from T-shirts to pencil eraser sets (of which I am now the proud owner of 2 — assembly required!). Some 30 percent of all Rovio revenues came in last year via its massive merchandising efforts. Of course, with all those “Angry Birds” game editions replicating like rabbits, you’re soon going to require a super-duper-bird-throwing-handheld-supercomputer to be able to keep up with all those pigs running around. One can only hope for some hopped up “Angry Birds”-optimized iPhone DRAM!